Social Hour Update: Prove Your ’80s Icon Status at the Rainbow Room Tomorrow! Bring a piece of ‘80s memorabilia and win “fabulous prizes,” including a photo with one of our surprise celebrity guests! Our Totally ‘80s Social Hour is just one day away! You’ve got your shoulder pads out, your L.A. Gears laced up and ready for dancing, and your palate is primed for $5 Deep Eddy drinks with the LAmag crew. But wait! We’ve added a little healthy competition to sweeten the deal. Inspired by our own Ultimate ’80s Challenge, which pit editor-in-chief Mary Melton against Vintage L.A.’s Alison Martino, we invite you to prove your own ‘80s icon status. 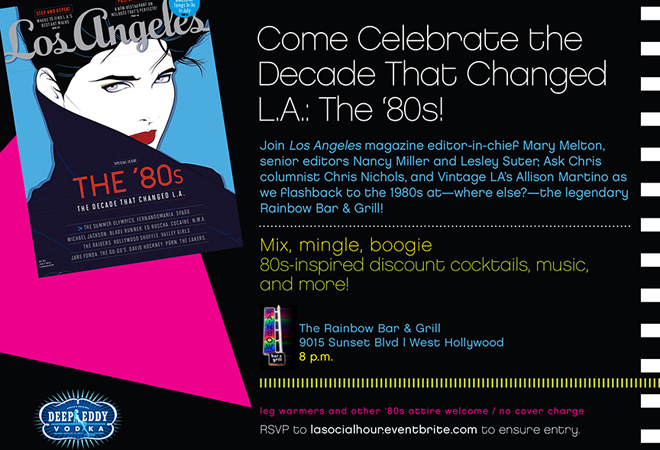 Bring your own piece of ‘80s memorabilia to the Social Hour event at the Rainbow Room tomorrow night. Editor-in-chief Mary Melton and Ask Chris columnist Chris Nichols will be on hand to judge the artifacts and pick the winner of the Ultimate 80s Rainbow Room Challenge. Just check in with a member of the Los Angeles magazine staff at the door for instructions on where to bring your little piece of history. Prizes will be announced at 9 p.m. so be sure to bring your item by 8:30 p.m. Here are the event details one more time. Hope to see you there! No Cover! Discount drinks, ’80s tunes, and more!